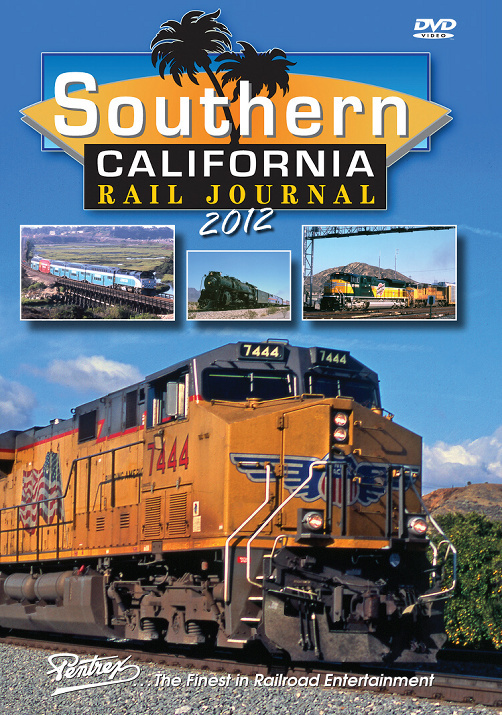 Southern California Rail Journal 2012 is a thrilling visual journey of trains and more trains in SoCal's heavy rail traffic areas and scenic locales. Presented in chronological order from January through December, you'll experience amazing new footage that has never been seen in any other show. Our crews focused on anything rare, scenic or unusual - and in this fifth installment of our Rail Journal series, we deliver just that! We invite you to join us on this exciting journey that will take you from the high desert to winter snow scenes. All six of Union Pacific's Heritage Units make an appearance including two of Amtrak's Heritage Units. You'll see Amtrak's Pacific Surfliner riding along the beautiful coastline and BNSF freight action over a 1,507-foot long bridge above the Colorado River. Enjoy the action as heavy tonnage tackle the challenges of Cajon Pass. You'll even get a rare glimpse of Beaumont Hill activity during a solar eclipse. This and so much more await you in Southern California Rail Journal 2012! SteamTeam (Indiana) on 2016-02-10 09:24:26. Ho hum...more trains in SoCal. This DVD illustrates what's gone wrong at Pentrex over the last several years - there's no story, just some guys trooping all over California shooting anything that moves and trying to make it interesting. It's not. All footage is shot approximately five feet above the ground, so there's little visual interest. There's no story - many of the trains are repeats from previous years' editions of "this blockbuster series." But that's not the best joke, which certainly has to be the narrator trumpeting that "we shot this in beautiful high definition!" Maybe - but they deliver it on good old fashioned standard-definition DVDs. Today's railroading scene is full of interesting stories to tell. You won't find any of them here.